At TechCrunch Disrupt on Wednesday, The Future of the Market Is Social panel was stocked with executives from new media commerce companies that have seen impressive growth in the past few years. Rather than trading on low prices, companies like Gilt Groupe, Etsy and OMGPOP work to develop other sales advantages. And they all emphasized the role of community in their sales efforts. But going forward, they agreed that retailers will be relying on another trick to sell goods: game theory. For example, Gilt Groupe has been around for 2.5 years. In that time, well over half of the members have been referred by existing members. CEO Susan Lyne calls it a multiplier effect. The company has used consumer sharing to grow their business rapidly in its short history. There are now more than 2 million members purchasing goods on the site. Many shoppers treat Gilt like a game. A trend that the company has used to great advantage. “There is definitely a game mentality when people come to Gilt,” says Lyne. Members use various strategies to purchase products on the site, including shopping in groups and reverse browsing the site to get items before they sell out. Considering the price of many goods on the site, that is one expensive game. But companies like Gilt work hard to curate goods and the people who might buy them. Rob Kalin, CEO of Etsy, says that historically, marketplaces have always been communities. Gilt does that by having short-term sales that are available to a small group of subscribers. But Lyne saw a commonality among all the retailers on stage. AdSense is one of the widely-used monetization tools amongst digital publishers, especially those of the smaller variety. Yet publishers have no idea what portion of the advertising revenue their sites generate is being shared with them by Google. Until now. Yesterday, in a move that has been discussed and anticipated for some time, Google has finally shared the AdSense revenue share with publishers. Google dominates mobile search. But will it be a money maker? Google’s dominance in search informs many of the company’s investments. And when it comes to mobile, Google has taken a hard stance against the applications that Apple champions, choosing instead to put its bets (and sizeable resources) on the future growth of the mobile browser. That makes a lot of sense. But what happens if consumers don’t use browser search in the mobile environment? Companies large and small have been getting into mobile this year. 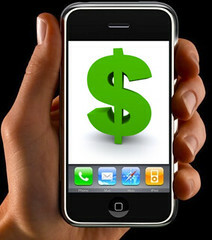 And one market that looks particularly promising is the mobile payment space. Considering that everyone from Twitter founder Jack Dorsey is interested in making a mark on mobile payments, it’s curious that no major credit card company has debutted a product yet. That’s changing with Visa’s new In2Pay protective iPhone case. The iPhone sleeve turns Apple’s smartphone into a credit card machine. 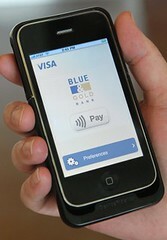 Considering Visa’s established dominance in the payment space, this product could help position the company in mobile. But it does not eclipse the fact that there is still a big space for innovation if someone can do it all cheaper.